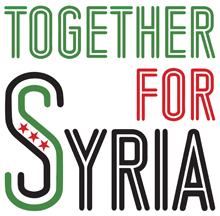 Recently Syria Solidarity UK arranged two events focusing on schools in Syria, one in Parliament on February 10th, hosted by Tom Brake MP, and one at the School of Oriental and African Studies, University of London, on February 15th. The following is an account of the latter event at SOAS. The speakers were Heba Ajami, a Syrian activist who worked in refugee camps in Turkey and Jordan, and Marcell Shehwaro, Director of Kesh Malek. Clara Connolly chaired the meeting. Heba Ajami started by summarising the damage to schools and schooling inside Syria: 3 million children are no longer in school; the enrolment rate across Syria is down to 50% from almost 100% prior to 2011; in Aleppo it is 6%. There have been 4,000 recorded bomb attacks on schools since 2011. School attendance is severely disrupted by security concerns; non attendance has led to early marriages among the girls and early recruitment by militias of the boys. Education in the liberated areas is conducted under constant airstrikes from the regime: teachers and pupils work in an atmosphere of fear and stress, with a lack of text books and equipment or space to play. As the certificates issues by the opposition interim government are not recognised, there is no way of progressing to higher stages of education. 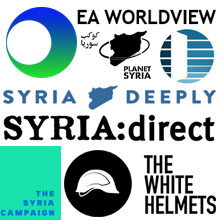 There are three main curricula used in Syria: Firstly the state sponsored curriculum which is infused by Assadist ideology; secondly an opposition version of the state curriculum minus the Assadism, produced by the interim government; and thirdly an Islamist curriculum sponsored by some donors for schools in liberated areas. Heba then described some of the problems experienced by Syrian refugees in the neighbouring countries: with resources for education already limited in the host countries (eg average class size in a Jordanian classroom is 40) there is no room for Syrian children; Syrian teachers are not allowed to teach; refugees have fled with no identification or certification so access and progression are limited; there is increasing discrimination against Syrians; extreme poverty means no access to uniforms materials or books; and child labour and early marriage are seen as survival strategies by impoverished families. NGOS and civil society organisations based abroad, such as Human Care, Hand in Hand for Syria and Kesh Malek run schools and provide much needed support. Marcell Shehwaro described herself as a trained dentist, Syrian opposition activist, blogger, feminist, and Director of Kesh Malek which is based in Turkey and funds and runs 7 schools in the Aleppo area. Despite the recent encircling of Aleppo by the regime and its allies, ISIS, and the YPG, the teachers in Kesh Malek schools are intending to stay with the besieged population rather than evacuating for their own safety – and indeed are considering enlarging the number of schools to 15. They are filling the vacuum left by aid organisations like UNICEF which works with the regime in Damascus, only operates with the regime’s permission, and has failed to reach children in the liberated areas. The Kesh Malek schools took part in the recent UN disability day project and drew wonderful pictures, not of sieges but of the sea. The schools have an ‘opinion box’ which encourages students to express their views—one class all complained together that their teacher was calling them ‘donkeys,’ so the school management had to address this. All other complaints and issues are investigated. The schools have to constantly update their health and safety policies to take into account constant aerial bombing; for example no glass in the windows—even clocks and geometric equipment have to be banned in case they hurt children in an explosion. The UN recently asked Kesh Malek to share the location of the schools with the Russians in the ‘hope’ that they would be thereby spared from bombing—Kesh Malek politely declined to share this information with the bombers. Kesh Malek also refuses to share or publish teachers’ names because they can be targeted for arrest and torture by the regime for working in liberated schools. Kesh Malek has established a project for teaching girls who have left schools for early marriages, they are visited by a teacher at home so their education can continue. 70% of Kesh Malek teachers are women—something that should be noted by international NGOs who offer Syrian women classes in sewing and cooking. She concluded by stating that Syrian schools—their pupils and teachers—need protection above all else. That is the priority. 10 billion dollars was granted in aid to Syria at the recent Donors Conference in London. This is taxpayers money: if no protection is provided (by way of a No-Fly Zone or otherwise) the money will simply be blown up by more bombs. Funding for the schools is needed, also, and will probably be needed for some time. It costs $3,000 per month to keep each school open—not a large amount of money for the international community. 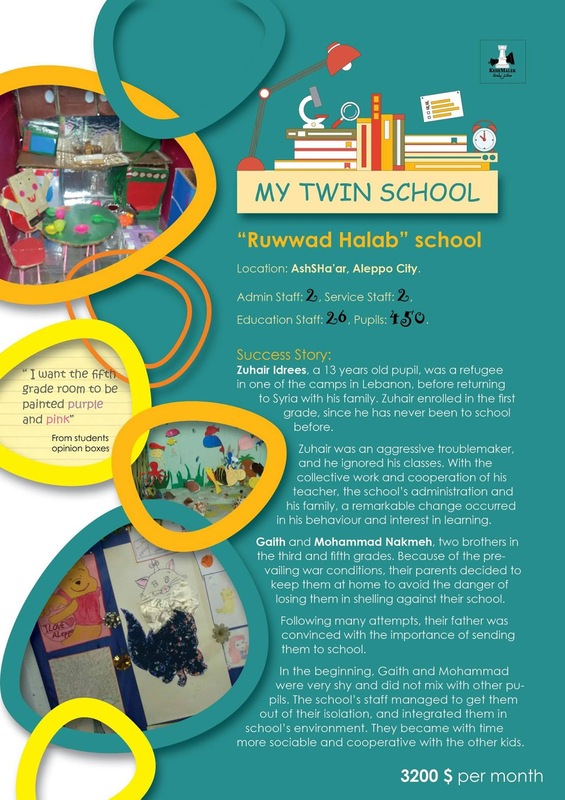 Some of the funding could be provided by twinning projects, between schools in Europe and in Aleppo, as was piloted with a school in the Netherlands. 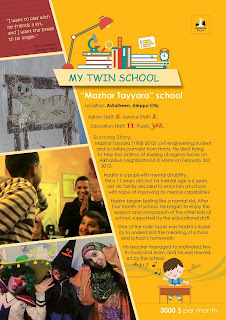 Kesh Malek has prepared a profile of five schools for such a purpose: see below. Finally, she said that the UN system of aid protection has so spectacularly failed in Syria—and Syrians have paid such a terrible price for this—that a new system is needed by the world community. There was a lively discussion; issues raised included a suggestion of twinning with international schools in various countries which are usually well funded; a National Union of Teachers project (it is hoped that Syria Solidarity UK can host a fringe meeting at the NUT conference in late March to take forward the twinning campaign in state schools); an NUS campaign to demand recognition by UK universities of the Syrian Opposition system of certification so as to allow entry to university by Syrian refugees; crowdfunding an initiative that would focus on older Syrian school children (i.e. teenagers) who are dropping out for marriage or war; looking at the experience of the Palestinian solidarity movement for ideas for education solidarity work; ideas for indoor sport (and sponsorship) which could be tried in the absence of safe outdoor space in Aleppo. 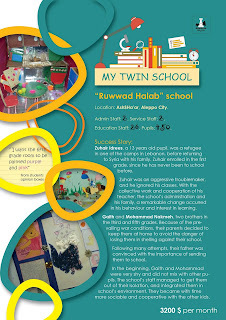 Heba Ajami’s presentation can be viewed and downloaded here. 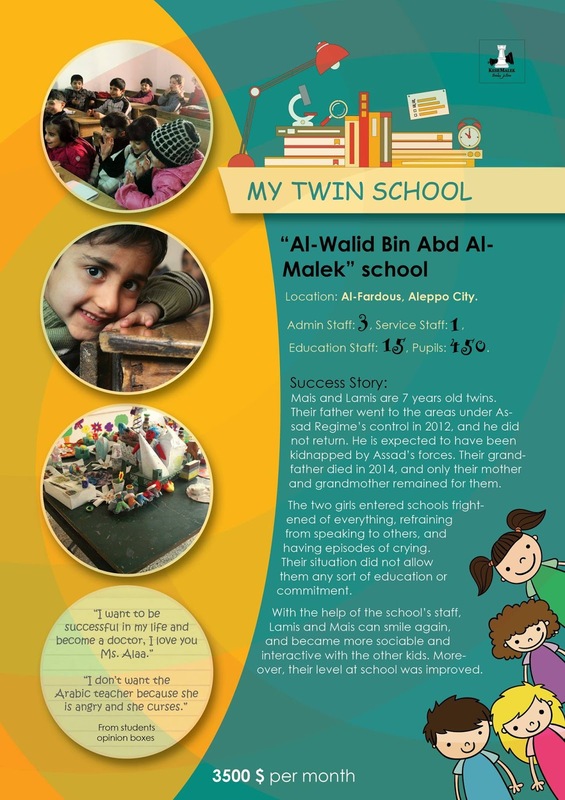 Kesh Malek’s profiles of schools for twinning can be accessed here. They are also reproduced below. Notes by Clara Connolly and Mark Boothroyd.